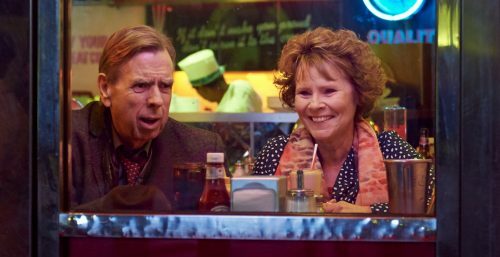 Filming in London has wrapped on Finding Your Feet, starring BAFTA award-winner and Oscar nominee Imelda Staunton (Vera Drake, Maleficent, Harry Potter, Pride) and BAFTA nominee Timothy Spall (Mr. Turner, Harry Potter, The King’s Speech) as the production moves to Rome for its final week of principal photography. © Tom Vandeputte / Finding Your Feet Ltd. Directed by award-winning Richard Loncraine (Brimstone and Treacle, The Missionary, Wimbledon, My House in Umbria), Staunton and Spall are joined on screen by British acting greats Celia Imrie (Bridget Jones, The Second Best Exotic Marigold Hotel, Calendar Girls), Joanna Lumley (Absolutely Fabulous, The Wolf of Wall Street) and David Hayman (The Jackal, The Boy in the Striped Pyjamas, Macbeth). Rounding out the cast are John Sessions (Mr Holmes, Filth, The Iron Lady) and Josie Lawrence (EastEnders, Skins, Enchanted April). When ‘Lady’ Sandra Abbott (Staunton) discovers that her husband of forty years is having an affair with her best friend, she seeks refuge with her estranged, older sister Bif (Imrie). The two could not be more different – Sandra is a fish out of water next to her outspoken, serial dating, free spirited sibling. But different is just what Sandra needs and she reluctantly lets Bif drag her along to her community dance class, where gradually she starts finding her feet… and romance. In this hilarious and heart-warming modern comedy, a colourful group of defiant and energetic ‘baby boomers’ show Sandra that retirement is only the beginning, and that divorce might just give her a whole new lease of life – and love. Said Loncraine of today’s announcement, “The London portion of the shoot has been a great success, and I’m enjoying it every bit as much as I enjoyed the script – a script that made me laugh and cry, often at the same time. I am genuinely thrilled to have taken this wonderful project from the page and on to the screen where it belongs”. Penned by Meg Leonard and Nick Moorcroft (Urban Hymn, St. Trinian’s), Finding Your Feet is produced by John Sachs and Andrew Berg for Eclipse Films, Nick Moorcoft and Meg Leonard for Powder Keg Pictures, James Spring for Fred Films and Charlotte Walls for Catalyst Global Media. Executive Producers are Brian Berg, Lynne Berg, Graham Begg, John Stevens, Jay Firestone of Prodigy Pictures, Bob Benton of Bob & Co and Richard Whelan. John Sachs and Andrew Berg of Eclipse Films added, “We are all incredibly proud to have got this very funny and moving film into production. We hope that it will be as enjoyable for future audiences as it is for us as producers to watch some of Britain’s finest actors bringing these unique and infectious characters to life under the direction of renowned filmmaker, Richard Loncraine”.